New York is not lacking for live holiday music: you can find performances of Handel's Messiah or Bach's Brandenburg Concerti nearly everywhere you turn. 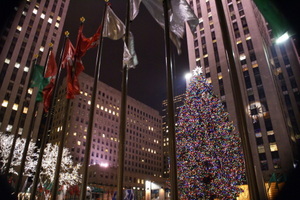 But, there are other holiday musical traditions in New York for those who might be looking for something a bit more different. 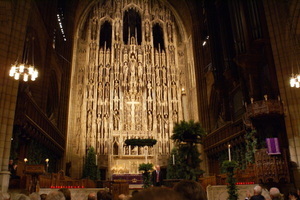 On Thursday night, the boys' choir of St. Thomas Church on Fifth Avenue gave their annual performance of Benjamin Britten's A Ceremony of Carols, under their director John Scott. Unfortunately, I got stuck at work, but I've heard the performance twice previously, and the choir is magnificent, certainly as fine as any you'll hear from the UK. I did, however, make it in time for the second offering of the evening: Olivier Messiaen's La Nativite du Seigneur, played by Scott on the Aeolian-Skinner organ. Scott, who I've written about previously, spent 26 years as the organist and Director of Music at St. Paul's Cathedral in London before coming to St. Thomas four years ago. 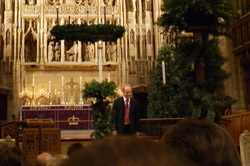 This was the fourth year in a row that Scott has offered this holiday performance of La Nativite du Seigneur, cementing his reputation as one of the great organists of our time. Messiaen was only 27 when he completed the hour-plus Nativite, but it is a work of staggering genius. It is laid out in nine meditations, with a reading of scripture - selected by Messiaen - preceding each of them. But this is definitely not your typical holiday fare: the multi-colored, often dissonant sounds come close to sounding like noise, and sent those who had come for the Britten scurrying for the door. 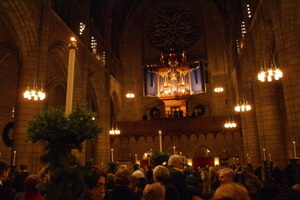 As a result, I was able to grab a seat in the front of the nave, where I could literally feel the air moving out of the massive pipes. Scott was simply astonishing: he played the delicate trills with breakneck speed, and blasted the tutti with unbelievable power. "My soul doth magnify the Lord, and my spirit hath rejoiced in God my Savior." After the final E-major unison, Scott came out and took two polite curtain calls. He is a meek-looking man of 52 in a plain blue suit, hardly resembling the madman we'd all just listened to for 70 minutes. For him, it's all just part of his duties - just as it was for Messiaen, who was the organist at Église de la Sainte-Trinité in Paris for over sixty years. 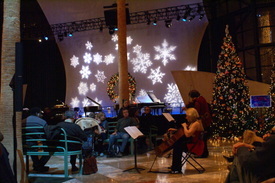 Last night, the engaging new-music quartet Ethel presented a Winter Solstice celebration at the World Financial Center's Wintergarden. An opening narration reminded us that the Solstice has been celebrated by cultures for thousands of years, far longer than Christmas, Hanukkah, Kwanzaa, or any other holidays this time of year. 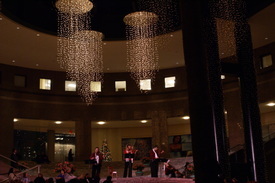 The performance, called "In the House of Ethel," was a collaboration with the director Daniel Flannery, who placed the musicians at various points throughout the atrium, occasionally augmenting them with costumed characters and evocative lighting. 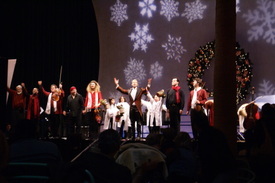 They performed new and recent works, several composed by Ethel members. Much of it had nothing to do with Christmas or the Solstice, but was instead meant to evoke the sort of ritual one would have heard in celebrations past. Highlights included Phil Kline's driving Tarantella; Raz Mesinai's Citadelle, with its repeating techno-rhythms; and Neil Dufallo's Take the 2 Train, which evoked Steve Reich's Different Trains. 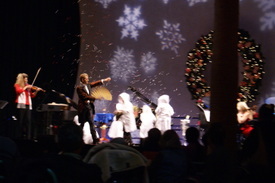 For the grand finale, an illusionist (Jarrett Parker) took the stage and did some impressive sleight-of-hand for six handpicked children, to holiday music arranged by Ethel members Mary Rowell and Ralph Farris. The crowd loved it: who said new music has to be a bitter pill? Watch out, Kronos: these guys are giving you a run for your money. I'm headed out for some more traditional fare tomorrow: a matinee performance of Bach's Christmas Oratorio, performed by the Orchestra of St. Luke's and the New York Baroque Soloists at St. Bart's Church on Park Ave. Tickets are $25-$35, available at the door. Postscript: Speaking of new holiday music, I've been listening to John Adams' El Niño the entire time I've been writing this, in the original recording with Dawn Upshaw, Lorraine Hunt Lieberson and Willard White. An extraordinary achievement, one-upping Messiah with its incorporation of medieval and modern texts in English, Spanish and Latin. I missed the BAM performance in 2003; one can only hope there are plans to bring it back sometime soon.